As this is not Sims related, I decided to put it here. 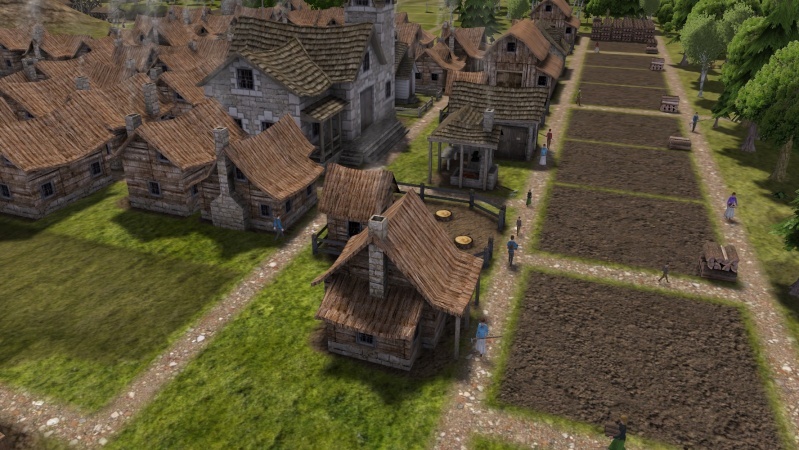 This is my Banished town of Simcoe. They started out with 12 citizens and now there are over 200. The trading post. Boat stops by about once a year with trades of food and resources. This is the only way to get crop and orchard seeds and cattle, sheep and chickens. 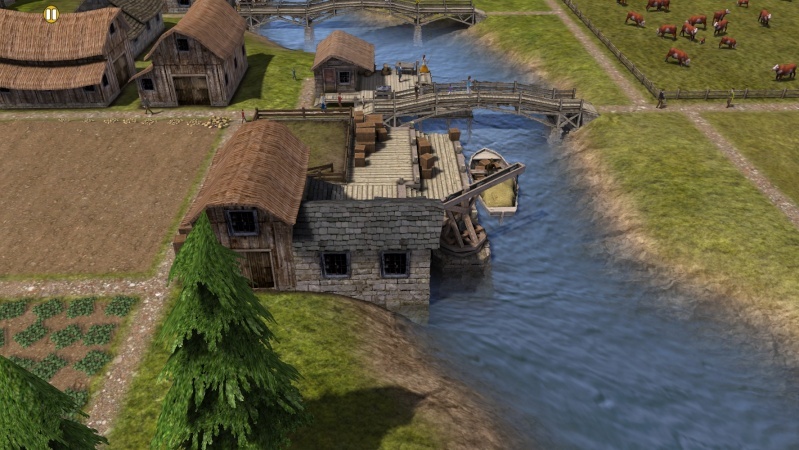 I have two trading posts on the river. Here is a crossroads in the forest. The building in the foreground is a Gatherer's hut. They gather food that grows in the forest, like mushrooms, roots, onions, and many more. The building with the tower is the forester's cabin. They cut and plant trees. The wood is used by the woodcutter to make firewood and is also used in building. The building with the plants out front is the Herbalist. They collect herbs used in making medicine. The last building is the hunter's cabin. The hunters hunt the deer that roams the woods. This provides venison and leather used in making hide coats. I have 3 such crossroads hubs in Simcoe, but only this one has the herbalist. This is the commercial row with all the stock piles where resources are placed by the labourers. The row has the woodcutters, blacksmiths, tailors and barns. This is the Town Hall. This building stores a lot of statistical information about the population. It will tell me all the information I could possibly need to know. Nomads periodically arrive asking to be allowed to stay, however, they can bring diseases. I didn't take a picture of it, but a hospital is important if you are going to accept nomads. This is the mining district. The big hole in the ground is a stone quarry. The two other structures are mines. One produces coal and the other iron. All of these items are used in building, but the iron and coal are also used by the blacksmiths along with logs to produce steel tools. Here are my minions building a Market. 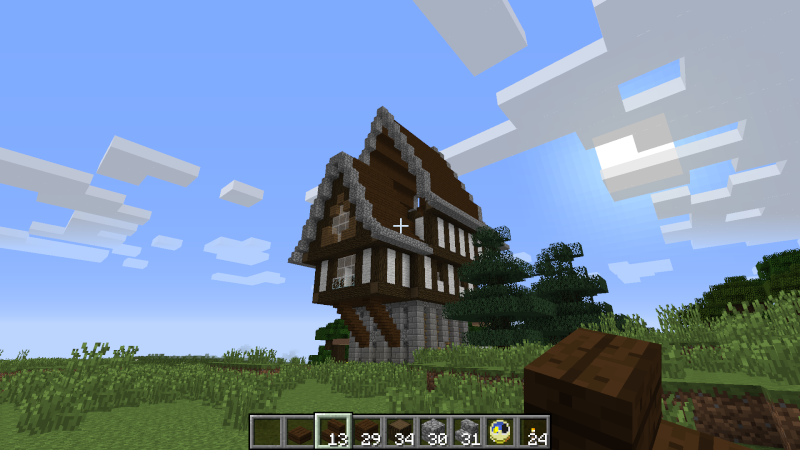 The finished building. The market can employ from 1 to 6 vendors. They stock the market with food and produced goods and raw resources that they collect from the barns and stock piles within their radius. 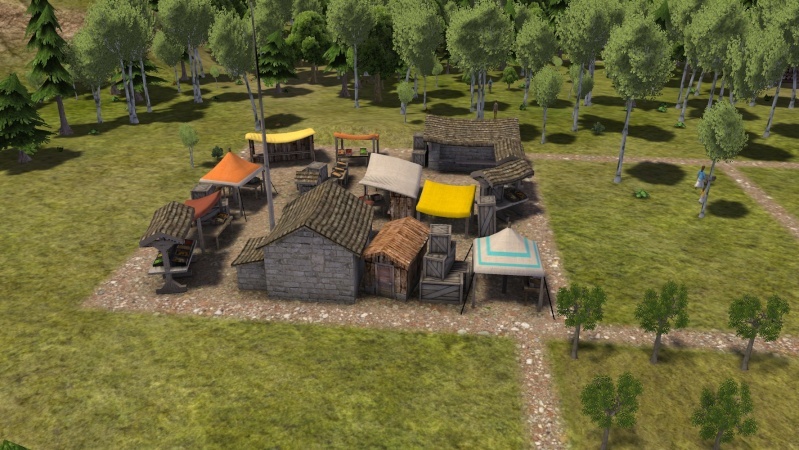 The citizens go to the market to stock their houses. This is the farming district. There are 8 crops possible in this game and here are fields for all eight. In the background, in front of the corn field, are three houses and a barn being built. 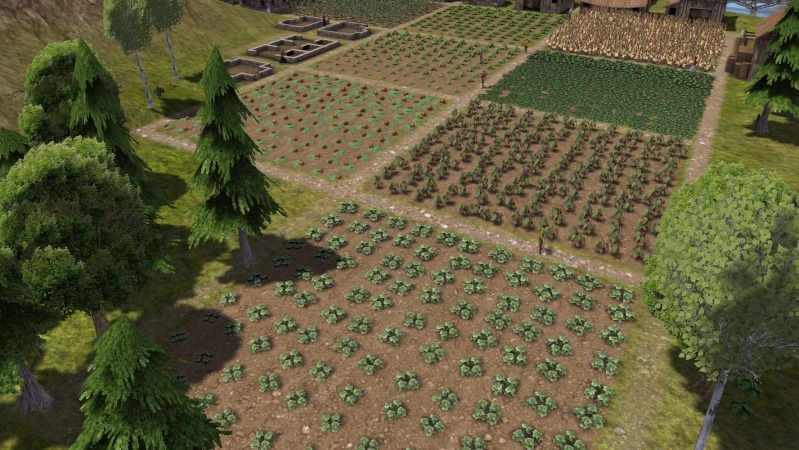 There are also 8 orchard crops available in the game. Three are nut and 5 are fruits that can be used in making alcohol, both for the citizens consumption and used for trading. I have 5 brewery hubs around the outskirts of the town. Maybe next time I'll take a picture of one. I find I spend hours playing this game. It is very engrossing and lots of fun. It also requires constantly watching the levels of resources to be sure that you don't run out of anything. Especially food, you must be sure that you always produce more that you consume.You also need to watch the growth of the citizens and build how as needed. I love it. Very impressive. I will be watching for more. Wow...now that is very cool! I would like to see more. Looks like something I would very much enjoy. I have a steam account but not enough on it to buy or I would be downloading already! Looks like an interesting game. I might get it sometime. I'm sure you will enjoy it very much BG. If you want any pointers just ask. Or you can watch Pinstar's Strategy and Tactics on YouTube. I have heard of this game but had no idea how cool it was. So glad you shared. I bought this a couple of weeks ago and am loving it. My village/town isn't as large as yours but I had a little hicup when I ran low on food and half my population starved, whoops! Great game though. I'm so gutted - this looks fabulous, but I can't get it for mac! I had that happen when the tools ran low. They don't produce as well working with no tools. Everything suffers. Very important to keep the production higher than the use. Did you have a Town Hall? It is a very useful building. So sorry to hear that. Maybe you could check the Devlog at Shining Rock, same link as above, and ask about if it will be released for MAC. Edit: I was reading through the Devlog comments on the new Beta 1.03 patch and someone has already asked that question. Here is the answer posted by Nmid. @keaton, you can play banished on a mac. There are a ton of links on the comments section of 1.0.1 beta as well. Just watched the video and this is a very beautiful world. I just fired up and played Tropico 3 a while the other night and played Castleville on FB a few days. The first PC game I bought was 1602AD and then I played quite a few of these such as Zeus, Poseidon, and names I cannot recall. They are fun but I do not stick with them as would rather Sim. I am glad you are enjoying it. The village looks really amazing in winter. @ Daisy. 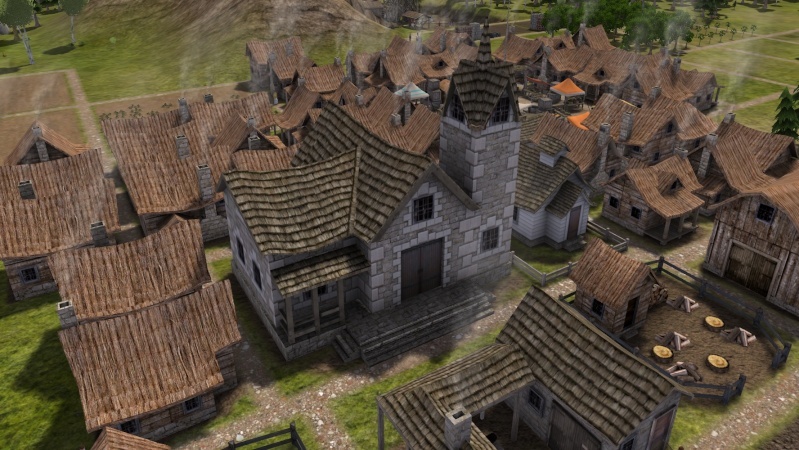 I've seen some videos on a couple of those games, but they never caught my interest like Banished did. I agree, Banished looks great in the snow. I'll have to include some pictures next time. I've been playing Minecraft today. 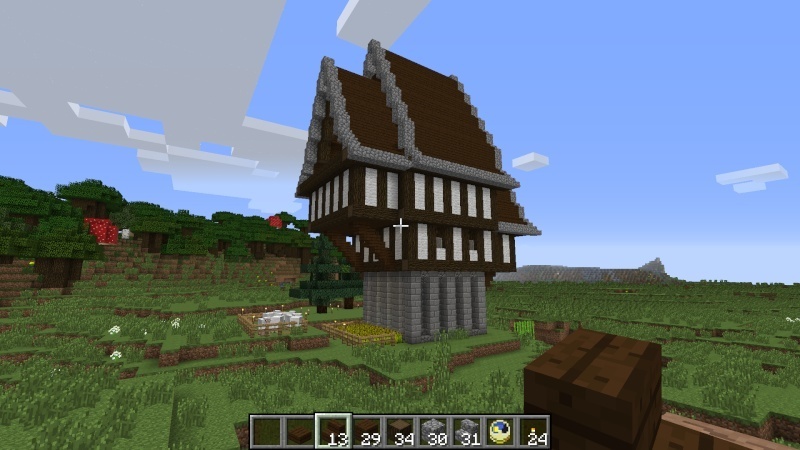 I'm building a small community and this is my first build. It is medieval style. This is what my avatar had to do to get the job done. It is still a WIP. I have the roof still left to finish and the interiors. I'm going to be adding a mill wheel and a pond to one end. 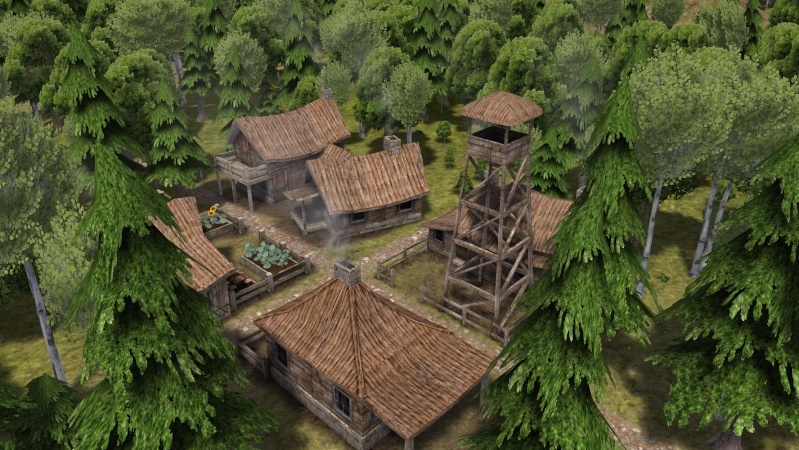 Banished looks so cool! Like to try it when I get the money sometime! Merry Widdow, I haven't played Minecraft, but I love Survivalcraft. I can get stuck on that for hours! I've never heard of Survivalcraft. I Googled it! Is it just for android and phone? Actually I play it on Kindle I'm not sure about other options. It's known to be the best Minecraft clone. Some say better but I wouldn't know having never played that. Does Minecraft also allow you to create custom textures? Yes, there are a lot of custom texture, skins etc. Check out Planet Minecraft. I don't have a cell phone or an android, so Survivalcraft wouldn't be available to me. I play Minecraft on PC. Oh cool. I didn't know it was available on PC. I have to check it out! 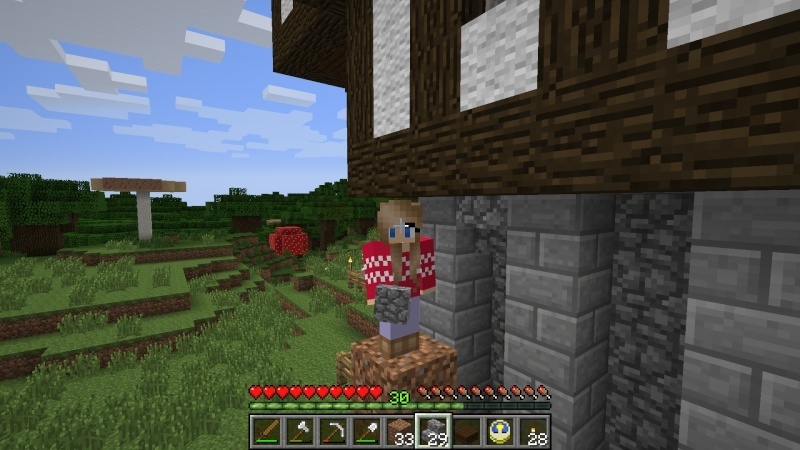 So glad you are enjoying it You put me onto Minecraft and I'm enjoying it very much. 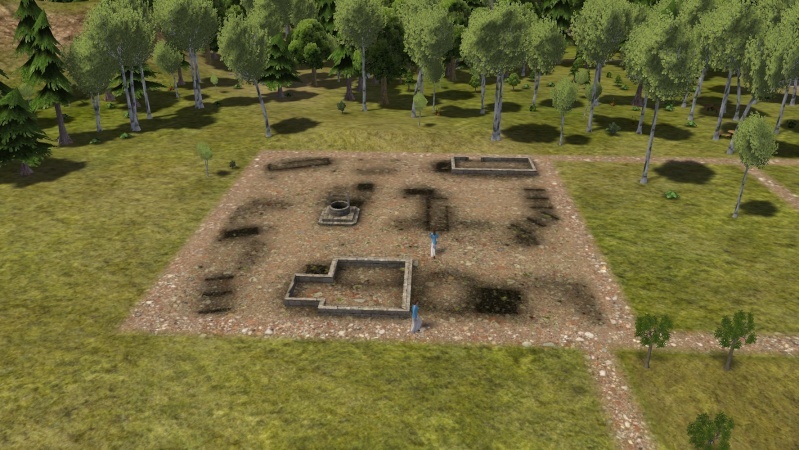 Let me tell you, Banished is making me sick....absolutely sick I am in Late Summer 26 and all my people are starving. Jez....hope a few survive to carry on! I can not turn this program off! I am sooooo addicted. My son has Survival Craft on his Grandma's IPad. It is really neat too. A lot of cool stuff. Hunter's cabin and fishing huts I feel are next best. Crops only harvest in the autumn so not as good until you get a better grip on food. Make sure you don't run out of tools as they produce much less. Make sure you don't run out of firewood as they will leave work to take firewood home and produce less. If there is not much food they will also leave work to get food and produce less. It is a vicious circle. If you have a trading post, you can trade for food, but you need something to trade with, like firewood if you have lots. Thanks. I have been growing squash and potatoes. Had 3 fishermen, 4 gathers and 3 hunters ( that's how much the building would allow) They still starved to death. I went from 35 Adults, 12 Students and some children. Now I have 10 Adults, 2 students and 2 children. I do have a trading post. I was able to get a couple sheep, so I can make and trade the wool coats. Made the mistake of trading off some surplus food for somethings. I don't think I will do that again. I watched Pinstar's youtube video and applied some of that toward my set up which seemed to work well but then I think I spread things out too much and they had walk along way to get back to the storage barns and storage plots. Even putting the storage plots near the work place didn't help me much. Live and learn...poor little settlers. By the way, is there a way to take screenshots in game? I googled it but couldn't find anything.